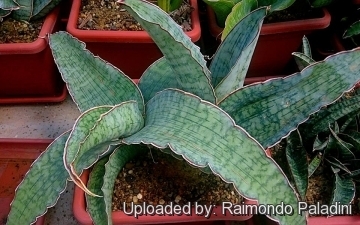 Description: Sansevieria kirkii cv. Silver Blue is one of the nicest Sansevieria distinguished by its unique super chunky silver blue foliage patterned with darker longitudinal lines and mottling. 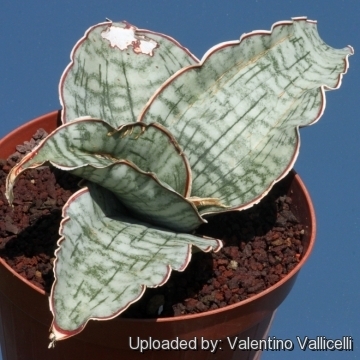 It is often named simply Sansevieria 'Silver Blue' as it remains to be seen if this plant is related to Sansevieria kirkii or not. For this reason many growers use the cultivar name only, and not the species name kirkii. The leaves are exceptionally thick and shorter, and seem different from the S. kirkii. Silver Blue is a very beautiful still a rare collector's plant. Bright light brings out the best leaf color. The flower is greenish-white, scented, and has a conical inflorescence. Habit: It is a compact acaulescent herb with creeping underground rhizomes from which spring several tuft of leathery leaves arranged in low-growing rosettes. Leaves: Not more than 1–3(–4) to a tuft, spreading to upper part recurved or even drooping, oblanceolate, about 30 cm long, 6–10 cm, broad at the middle and very rigid, flat in the upper half when mature, channelled in the lower half, 2.5-3.5 cm thick at the middle, dark bluish-green mottled on both sides with silvery-white with longitudinal dark green lines. Margins very wavy with a narrow, hardened, red-brown and white marginal line often breaking up into thread-like fibres. Apex very rigid to stiffly coriaceous, tipped with a horny spine. Midrib broad, rounded on the back. Flowers: Erect or ascending, 2-15 cm long green on the back and tips, the rest brownish-pink ans shented. Stamens as long as the perianth-lobes, filaments about 17cm long, anthers 4–5 mm long. Style 15-16 cm long considerably exserted beyond the lobes. Fruit: The fruit is a globose berry. 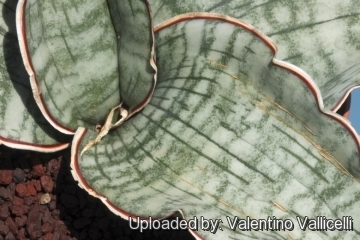 Sansevieria kirkii Baker: has very horny leaves in texture, with a brown undulating edge and much mottled on both sides. The flower is greenish-white, scented, and has a conical inflorescence. Distribution: anzania, Malawi and Zanzibar. Sansevieria kirkii var. pulchra N.E.Br. : has attractive rippled, undulating, dark green leaves, smudged with light green and reddish margins. Very showy white flowers are in rounded clusters that arise on a stout inflorescence from the center of the plant. Sansevieria kirkii cv. Silver Blue: has super chunky silver blue foliage patterned with darker longitudinal lines and mottling. The leaves are exceptionally thick and shorter, and seem different from the S. kirkii. Distribution: Mbeya Province, Tanzania. Sansevieria kirkii cv. 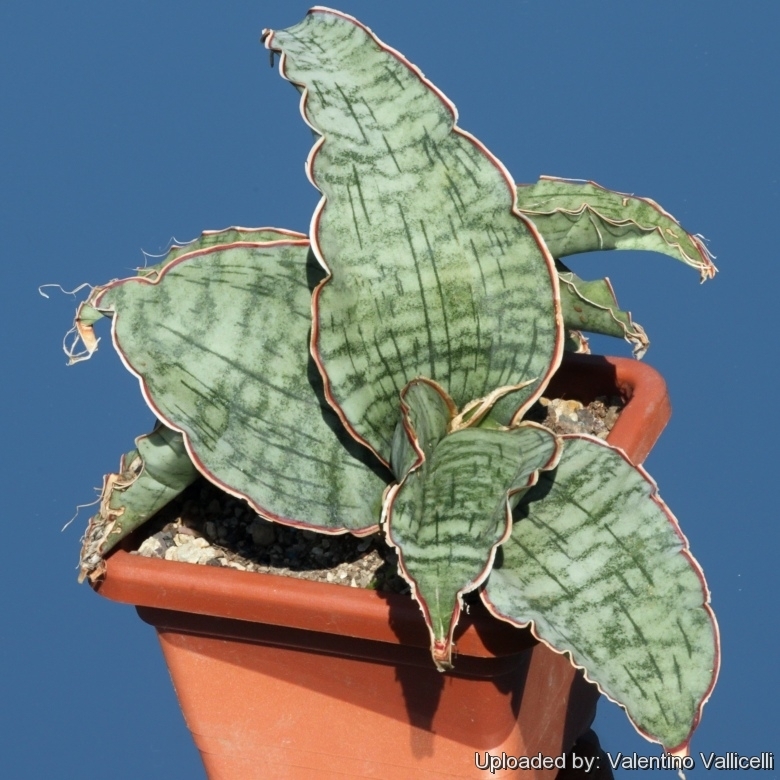 Silver Blue variegata: has chunky mottled silver blue foliage variegated with cremy-yellow longitudinal stripes. Margins are very wavy with a narrow, hardened, red-brown and white marginal line. Cultivation and Propagation: Sansevieria kirkii cv. Silver Blue is one of the slowest of the Sansevierias to grow but easy to cultivate. It is a very drought tolerant plant, but not as cold hardy as some. It needs heat and dry air in Winter and half shade in Summer. Does best as a pot plant. Like all snake plants, it is very efficient in removing pollutants from indoor air. Growth rate: It is not the fastest Sansevieria and takes several years to grow to maturity and offsets. Soil: Use a soil mix consisting of 3 parts loam to 1 part of pumice. Fertilization: They are fertilized once during the growing season with a balanced fertilizer. Repotting: It must be repotted in larger containers as it grows, without being divided. This way it can grow big, and start to show its mature features. Watering Needs: The plants are very drought tolerant and are watered about every other week during the growing season. During the winter months they are watered once a month. Exposure: Will tolerate low light levels but grows best and flowers if given bright light and even tolerates full sun. Afternoon shade in summer. Frost Tolerance: Avoid any frost. This species is dormant in winter, keep it at or around 4°C. Outdoors: In the garden In mild to tropical climates it prefers semi-shade or shade and it is not fussy. Use: It is a great container plant for interior or exterior use that needs little care. It makes a choice designer's architectural statement. It is popular as an ornamental plant as it is easy to culture and take care of in a home. Warnings: It is toxic (has oxylates that cause oral and throat irritation) if chewed or eaten. Propagation: They are propagated by cuttings or by divisions taken at any time. Cuttings should be at least 10 cm long and inserted in moist sand. A rhizome will emerge at the cut edge of the leaf.